Over a year has passed since Jaedong returned to his former home, that of competitive Brood War. Considered one of the best zergs during the KeSPA era, he was a ruthless competitor and a mechanical monster born out of pure passion and love for the game. A hard worker with plenty of humility and kindness while lacking in arrogance; qualities that only a few possessed but, were highly sought after. As someone who was nicknamed the Tyrant, had multiple titles under his belt, various innovations in the ZvZ matchup and held an overall winrate of 67%, Jaedong stood on a platform that only a few zergs over the years have managed to climb. Thus, he was always brought up as an example of someone to strive for and emulate. Adored by fans all over, he was no stranger to the spotlight and he has always tried to reward his fans with good games. A common anecdote that was discussed between progamers was about the one time that Jaedong missed a single dropship in a long ZvT game. Anyone who has played a long Starcraft game understands the fatigue, drain and lack of attention that results from this, so in hindsight, the majority of players would excuse themselves. But, Jaedong was mad at himself for missing it to the point that he proceeded to scourge every dropship afterwards, never missing a single one. What really stands out from this story is Jaedong's attitude and approach to the game. Someone striving to be the best has to constantly push himself in order to stand at the top of the throne. However, this also means that every loss would sting even worse than the last. Tales of Jaedong balling his eyes out after losing important matches were passed around. While practice makes perfect is a common motif, in a highly competitive game such as BW, many factors such as preparation, execution, decision making, attention to minute details etc... play a role and unless a player is heads and shoulders above his opponent, there is never a guarantee of victory till the opponent taps out. Having played both Brood War and Starcraft II competitively for over 10 years, Jaedong has his fair share of wrist injuries due to his relentless work ethics. Despite this, he continues to persevere at the cost of his health. After all, this is an individual who wants to be remembered by the fans as "someone who can do something out of nothing". After coming back to the scene, he made his first foray into Afreeca Starleague Season 2, by making it through the tough Busan qualifiers. In the Ro24, he was placed in a group with Mong, BeSt and Hint. He advanced in second place off the back of beating Mong in the final match after failing to beat BeSt in the winners' match. Taking part in the group selection ceremony afterwards, Jaedong wore a mostly exhausted impression all night. Whether it was due to his physical condition or a lot of other thoughts, something was definitely amiss. He continued his march in the Ro16 and was yet again confronted with the hurdle that was BeSt. Jaedong never relented even in defeat and up against 2 terrans in his worst matchup in the post-KeSPA era, the Tyrant showed his true colors and fighting spirit, mind gaming both Sharp and Mind in consecutive order to advance from the group. In the quarterfinals, he met fellow player, Stork, who he crushed 3-0 in one-sided fashion before meeting his final challenger, the GOAT Flash in ASL2. With the end of professional BW, few could've forsaw what was about to take place. A bout between two players, LeeSsang, was about to unfold. The coveted FvJ that had stolen the hearts of BW fans was about to be played out, years after the possibility of an encounter diminished. History was made that day. In order to help him perform at his best, Jaedong opted for more steroidal injections to control the pain. He tried his hardest to overcome Flash but, came up just a bit short. However, his never die attitude and baller status were on full display that night. To all the fans that swarmed the Afreeca studio, Jaedong showed that meticulous preparation can overcome even a God at times. Though it was not the championship that he desired and many fans wanted, a 2-3 loss to his eternal rival, Flash, who himself wasn't sure if he would win, would surely reinvigorate the Tyrant even further and many were hopeful for the next ASL. Their rivalry also managed to show that BW was alive and well with upwards of 300 thousand people tuning in for their battle. Alas, it's possible that Jaedong's condition was worse than previously stated. After all, he is mortal and wrists aren't built to withstand such intense workouts. His physical condition had been constantly deteriorating all along. However, Jaedong kept up with his rough regimen, only taking breaks when needed while participating in several online clan games, all in order to repay the fans for their kindness and support over the years. His eyes were on the prize, an ASL championship to show that the Tyrant is back. After being seeded into ASL3 Ro16 in a group with sSak, Last and hero, Jaedong found himself even further from his dream than he previously anticipated. Losing his first game to sSak on Andromeda after gaining a fourth base, he eliminated hero in the losers' match but, could not draw on his full strength to beat Last on Circuit Breaker. In a closely contested game, Jaedong almost managed to break Last to advance but, the terran who is considered a beast of his own held on by a hairline to eliminate the Tyrant. It was a major drawback for Jaedong, however, much like the past, he was determined to keep fighting. Against all medical advice from his doctors to stop playing the game, Jaedong continued to practice on his stream. Ice packs were used to help manage the pain in between games and it seemed that Jaedong had several other medical problems that were likely hindering his performance. Carpal Tunnel syndrome was already known about by fans but, revelations were made to the foreign community regarding a chronic eye condition called Keratoconjunctivitis Sicca, aka dry eyes which were affecting his vision. Jaedong also suffered from Flexor Tendinopathy, also known as Golfers Elbow, which can lead to severe pain with continued use and required some rest. Despite all the setbacks and the fact that constant gaming will make his prognosis worse, he decided to play in the ASL4 qualifiers and made it through the Seoul qualifier. In the Ro24, he bested both Hiya and Mini on Gold Rush and Fighting Spirit respectively with flashes of brilliance shown in his game. He was present at the group selection ceremony but, once again, it seemed like he was in a daze. Unfortunately, he ended up landing in a rough group in the Ro16 and his path was cut short yet again. Having made the winners' match after beating Stork, Jaedong lost a thriller to Soulkey on Gold Rush. He proceeded to face Rain in the finals' match but, the young protoss got the upper hand after some solid defense, thus eliminating the Tyrant. Once again, Jaedong faced a solid wall that he was unable to overcome. How frustrating it must've been to realize that time and age are catching up to you. That victory, something that was seized naturally in your prime, has been evading your grasp. After Jaedong was eliminated, rumours floated around that this was his last BW tournament. At the time, these rumours felt like the truth, especially considering his health and inability to perform at his desired level. Many of his fans wanted him to rest and take a break, rather than injure himself trying to seize another title. Alas, Jaedong has other plans and has continued pushing himself. He has been winning more games lately on stream, taking games off Flash and has improved even further. He decided to take part in the ASL5 qualifiers and made it through the Seoul qualifier recently. He is set to continue competing when ASL5 resumes in March. Whether Jaedong finally manages to break through the Ro16 is anyone's guess, however, regardless of the outcome, one thing is certain. His attitude and determination are a lesson for us all. His BW legacy, his mental fortitude, his propensity for making the unexpected happen and his hatred of defeat will be stories that will be spoken off for ages. The Tyrant is coming! Thanks for a good read, hate these injuries putting excellent players and talents on the sideline. 이재동 화이팅! Nice read. I will believe in Jaedong until the very end, though I do want him to rest at this point. One last sprint JD and then please rest on your amazing legacy. The Tyrant is coming.... well said sir. This is fake news. If I were editor, such a statement would never see the light of day. I really like this article! Really beautiful how it was written. My favorite line is "he was a ruthless competitor and a mechanical monster born out of pure passion and love for the game." In the photo above did Jaedong really cry? Do you guys know what specific game that was coz I want to watch it. It is the same game about him sniping all the dropships? Would love to see that too. I really like watching Jaedong play, you can really sense the passion he gives to the game. Hasn't JD been talking about retiring for at least a year now? It's crazy that he comes so close every time but decides to keep competing, I can't imagine how painful it is to keep competing but how much he wants it. I have nothing for respect for Jaedong. I really wish that he'd place his health above everything else though. Maybe if he wins this ASL he'll finally look after his own health. Now I'm really hoping he wins this ASL so that he can finally take a break or retire for the sake of his health. Jaedong has always been a player who does not have the greatest talent for RTS but the greatest mentality and work ethic imo. jd was always a favorite pro. athletic life takes its toll. I am convinced that Jaedong is by far the most well disciplined individual I have seen within an e-Sports industry I have witnessed thus far. NaDa: "Professional gamers need to have drive and passion, but they also need humility. Jaedong is very skilled, but has humility on top of that. He is at the apex, yet is respectful to everybody around him, regardless of their age. He deserves the title of a professional." January (ex-manager of Samsung Khan): "I like his gaming style, and every time I have talked to him in person, I was impressed with his attitude and mindset. His gaming style and attitude is what I want from a player. He is hard working also." Horang2: "I want to learn from Jaedong's mindset. The way in which he sustains his form through practice even though he is at the top is truly astonishing." JangBi: "The best player is Jaedong. He is a gaming machine. How do you even practice that hard? It is mind boggling." Lee Jae-Kyun (ex-manager of Woongjin Stars): "I believe that the player who has everything a manager could want from a gamer is Jaedong. It is not only his results he brings, there is nothing to fault about his mindset or the way in which he applies himself during practice. If I tell a player that he needs to play a hundred matches in order to win in a single televised match, most players would be exasperated with the work load. Jaedong would take it in strides. That is what differentiates him from the rest." Jaedong (I'm roughly paraphrasing what he once said on stream): "I know for a fact that I was the hardest working player back in the days. It is not just about playing the most amount of games. It is about pushing yourself to your limits with each and every game." Jaedong may not be the most talented gamer to have touched the game, but the way in which he applied himself during his professional years cannot be matched by anyone. Yes there were those who matched his discipline in very short bursts, but none that managed to sustain that level of rigor and devotion to a single craft for that long. It is something I haven't seen from any video gamer I have heard or seen thus far. That was beautiful, great write-up! I hope so much that JD is able to pull through in ASL5, doesn't have to win it, just come far!
" Tales of Jaedong balling his eyes out"
"heads and shoulders above his opponent"
Great stuff as always! But, also as always, I wonder where the editor for BW news is. Great read. Kinda wish he'd retire for his own future's self so I'd be so happy if he could break through during this coming ASL and get a happy end to his career. YESSSSSS JAEDONG FIGHTING !!!!!!!!! I LOVE YOU JAEDONG !!!! PS: OF COURSE HE ISN'T MORTAL ! 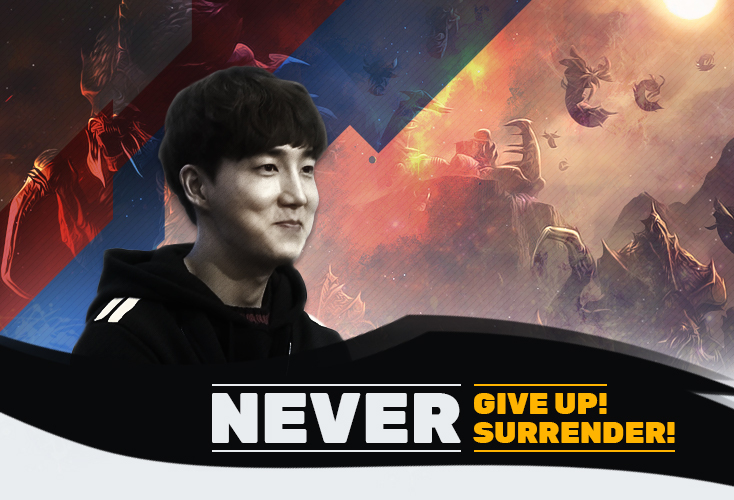 And yes, please Jaedong, never give up ! Or atleast not until I went to Korea with the only goal of seeing you play a live final before my very admirative eyes. everyone should strive to be like jaedong in their lives.